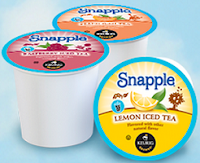 Right now Target is giving away FREE Snapple Brew Over Ice K-Cup Sample Pack! Just click "Request Sample", answer some questions and fill out the form! Enjoy the great taste of Snapple Iced Tea home brewed any time. You can thank us later! Brew Over Ice K Cup packs are specially crafted to brew directly over ice with the Keurig brewing system.